In August 2016, Friends of Carrollton GreenBelt partnered with Keep Carroll Beautiful to promote the Adopt-A-Trail volunteer program. 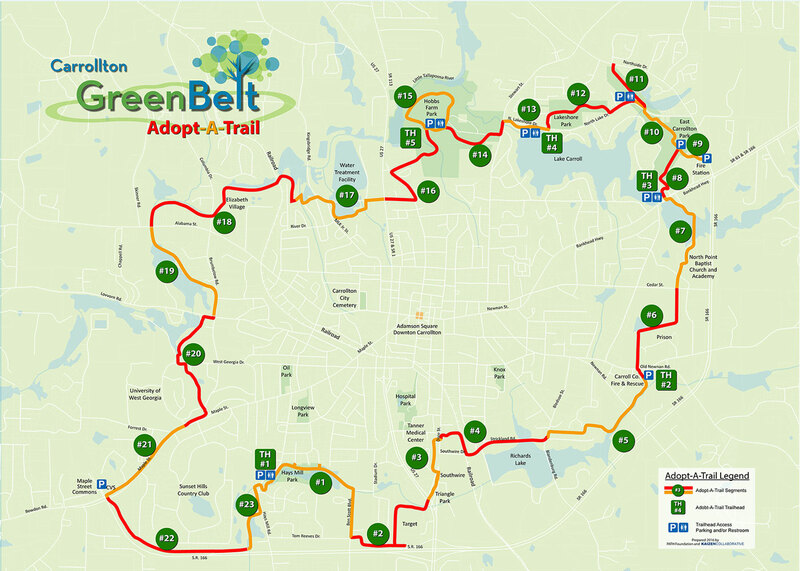 The Adopt-A-Trail initiative is a great way for individuals, families and organizations to get involved with the Carrollton GreenBelt by supplementing the maintenance efforts of City of Carrollton Parks and Recreation Department. Carrollton community is invited to take responsibility for the trail by performing simple tasks that include picking up litter, reporting repair needs and cleaning trail signage. Keep Carroll Beautiful is currently managing the Carroll County Adopt-A-Road program, and will aid the Carrollton GreenBelt with volunteer registration, selection and training. Please fill out and return the application to Keep Carroll Beautiful. Anyone can sign up to care for a section of the trail. We welcome individuals, families, churches, social groups, schools, scout troops, community organizations and businesses. As some parts of the trail are longer and more remote than others, groups of at least two volunteers are encouraged. To successfully adopt a trail, volunteers are required to attend a half-an-hour orientation. THIS MAP IS FOR ADOPT-A-TRAIL USE ONLY.